November was a whirlwind month. I feel like I say that about every month, but be prepared to hear that about December as well. I’m trying to end the year strong. And so I’m frantically trying to read all that I can and get caught up. So I can start 2019 with a good head start, and being caught up a lot. One can hope right? This month was a wild month. I don’t even remember a lot of what I read. I mean, give me the title and I can tell you what it was about, I just don’t remember the order anymore. But I was able to get caught up on some arcs from BEA like EMPIRE OF SAND and EVERLASTING NORA. This was also when I tried to catch up, which is why you see reviews like SOMEONE LIKE YOU, GIRLS ON THE LINE, and LOVE A LA MODE. My favorite book from this panel has to be LOVE A LA MODE because it was so adorkable. Not to mention a parallel between my partner and I. And I was able to read a First to Read book this month, THE MORTAL WORD which is maybe the end of one of my favorite series ever. I was also able to read one Edelweiss book, WHAT IF IT’S US, which was so cute. But in general Edelweiss really suffered this month. I want to be better about it next year. If you like Nutcracker re-tellings, pick up THE ENCHANTED SONATA. I’ll have an interview and giveaway coming up next week too. I was also able to read two sequels, SISTERS OF FIRE and CHARMCASTER which I adored. In this panel, I would have to highlight IGNITE THE STARS which was phenomenal. You can catch the review later this month, but if you like SF, strong women, and outlaws, this book is for you. And finally, my last books of November. This was such a great panel for sequels with FIRESTARTER, EVERMORE, SOULBINDER, and THE GAME OF LUCK. But I think it’s a tie for which book I loved more with THE GILDED WOLVES and THE GIRL KING. As you can see this panel is extremely 2019 heavy. I am trying to make sure 2019 reviews are timely for you all. That’s a pretty even spread, but I’m so excited already for 2019. 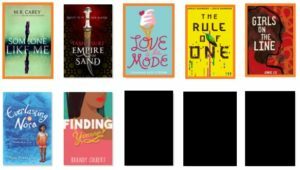 Not to mention since December, I’ve finished some other really great 2019 books for you! 2019 is going to be amazing. 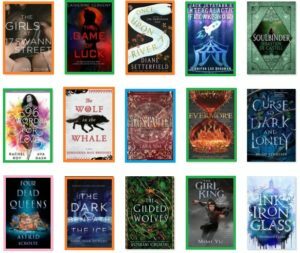 (But how was it even possible for me to read 37 books this month? It helps that one of those was an audio book, but it certainly explains why I can barely remember the month). 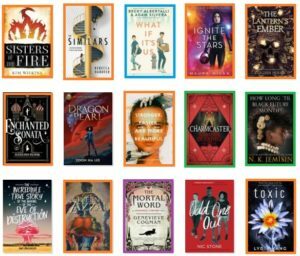 This month I want to highlight books I am excited about for 2019. So you have time to get all your pre-orders submitted. THE GILDED WOLVES was fantastic and the pre-order comes with some gorgeous cards. Not to mention there’s a B&N exclusive edition that I hope is gorgeous. Then there’s THE GIRL KING which I was able to get personalized at Blogbound Con by Mimi Yu. I knew I’d love it and I DID! But in terms of books that surprised me the most, THE DARK BENEATH THE ICE was such an eerie surprise. If you feel like you missed out on Halloween and want some winter chills, go check it out. I’ve already talk about how much I adore LOVE A LA MODE and IGNITE THE STARS, so I feel like 5 books is a good amount for 37 books. What were your favorite books from November? Thank you! And What did you think!? !